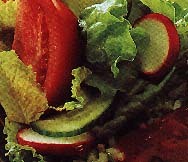 Recipes for Salads, Diet food. Click above for details about these and many more Salad Cookbooks! Salads are wonderful, with their crisp and crunch. Not only are salads good for you, but they are beautiful when done with love, and they provide lightness and sparkle to a meal. They are also a mainstay of the dieters repertoire, providing lots of bulk and good flavors with very few calories. A salad can be as simple as a few torn-up lettuce leaves with a sprinkle of oil and vinegar, or serious productions with everything from lettuce to anchovies, pastas, cold meats, odd cheeses and fantastic dressings. We hope you enjoy this sampling of the wonderful world of salads. Note that we have added new cookbook and kitchen stores. You may be especially interested in our new sections featuring cookbooks from popular TV chefs. and accessories click on the Cooking.Com banner. Cooking.com is a leading online retailer of kitchen and house wares with over 50,000 products for cooking and entertaining. Shop for every major brand in cookware, bakeware, small appliances, cutlery, cook's tools, tableware, and much more. With a 100% satisfaction guarantee and secure ordering, we'll take good care of you at Cooking.com. Established in 1998 and based in Santa Monica, California. Cooking.com has received BizRate's Circle of Excellence Award for outstanding customer service. click here to visit www.Bruce-Moffitt-Jewelry.com. Website Design and Management by: Premier Systems.Com.